Environment Minister, Thérèse Coffey is currently in Kenya seeing efforts to tackle the illegal wildlife trade and meeting with officials and representatives of the Kenyan government to discuss the continued partnership between the two countries. 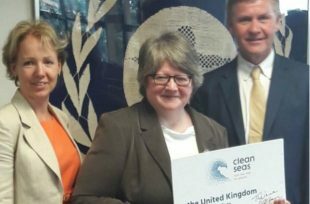 Yesterday Minister Coffey visited the United Nations office in Nairobi and pledged the UK’s continued support for the #CleanSeas campaign to turn the tide on plastic in the ocean. Erik Solheim, the Executive Director of UN Environment updated the Minister on the progress made since the campaign launched in February 2017. Discussions were also held with the Kenyan government on the upcoming Commonwealth Heads of Government Meeting due to be held in London at the end of April. The Minister’s visit coincided with the announcement by the Environment Secretary, Michael Gove, that the UK would introduce a ban on ivory sales. I welcome the opportunity to discuss this issue and many others with the Kenyan Government and I hope through this continued dialogue we can further continue the successful partnership of our two countries.